Along California’s Pacific coastline, San Diego and Santa Barbara sunshine beckons you outdoors, the Carmel coast waits to fill your camera roll, and an overnight in San Francisco adds big city adventure to your journey. This magical city is festive and friendly, from its legendary zoo to Balboa Park everyone here seems to be living that quintessential California lifestyle – sun, sand and surf. Between ocean and desert, the near perfect weather here is ideal for exploring charming neighborhoods, gorgeous parks, and of course, the beach. Fair Mediterranean-style weather coupled with beautiful Mediterranean-style architecture make Santa Barbara a prime destination. Sunny days can be spent strolling through the Santa Barbara Zoo, exploring boutique- and restaurant-lined State Street, dining on Stearns Wharf or experiencing the wineries of nearby Santa Ynez Valley, producer of world-class vintages and home to photogenic landscapes of golden hills and venerable oak trees. California’s original capital is steeped in Spanish and Mexican history, but it is primarily known today as the home to the world renowned Monterey Bay Aquarium, a leading advocate in ocean conservation. Steps from the Aquarium sits Cannery Row, made famous by John Steinbeck, and Fisherman’s Wharf. Catch sight of harbor seals, sea otters and pelicans in their natural habitats at the Monterey Bay National Marine Sanctuary. Indulge in the San Francisco lifestyle by grabbing a bite of clam chowder as you walk through Fisherman’s Wharf, catching some sun with a breathtaking view of the Golden Gate Bridge on Baker Beach, or hop on a trolley to ride around the renowned hilly streets. Ensenada, third-largest city in the state of Baja, is famed for many things. Sunny and mild weather helps yield fine wines considered to be the best in Mexico. Ensenada also boasts several celebrated surfing spots. A third lure is off-road racing, with the Baja 1000 and Baja 500 each held annually. Rivaling Carnival in Rio and Mardi Gras in New Orleans is Ensenada’s Carnaval, when revelers fill the streets for six fun-filled days. Migrating gray whales draw their fair share of travelers as well. Sharing the limelight with her fleetmate, Crystal Symphony is one of two magnificent ships that has earned Crystal Cruises the distinction of being The World's Most Awarded Luxury Cruise Line™. 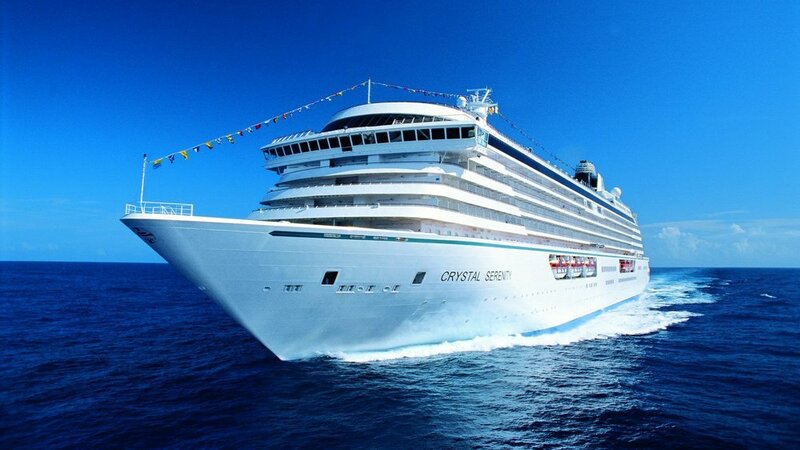 Crystal’s expansive onboard experience begins with personal, genuine service offered by their expertly trained staff at every point in the guests’ voyage. Enhancing this welcoming, homeaway-from-home atmosphere is a host of all-inclusive amenities and experiences designed to create a seamless, unforgettable vacation experience for travelers who seek the very best. This October, the Crystal Serenity will enter dry dock for a three-week refurbishment that mirrors the dramatic changes that debuted last year aboard Crystal Symphony – and then some. With an aim to elevate the onboard guest experience by expanding the space and choices that have been part of the company’s credo since its inception, the award-winning ship will see a transformation of accommodations, dining options, technological advancements and public spaces. *All fares and savings are per person, in U.S. dollars based on double occupancy. Cruise Fares and Your Exclusive Fares are cruise only and do not include taxes, fees, and port charges of $368.00 per person. Your Crystal Savings are subject to availability at time of booking. Book Now Fares are per person in U.S. dollars, based on double occupancy for the first two full-fare guests in suite, include all Book Now Savings, and, do not include taxes, fees or port charges. All fares and savings vary by category and departure date.